I found this recipe in my November 2013 issue of Womans Day Magazine. 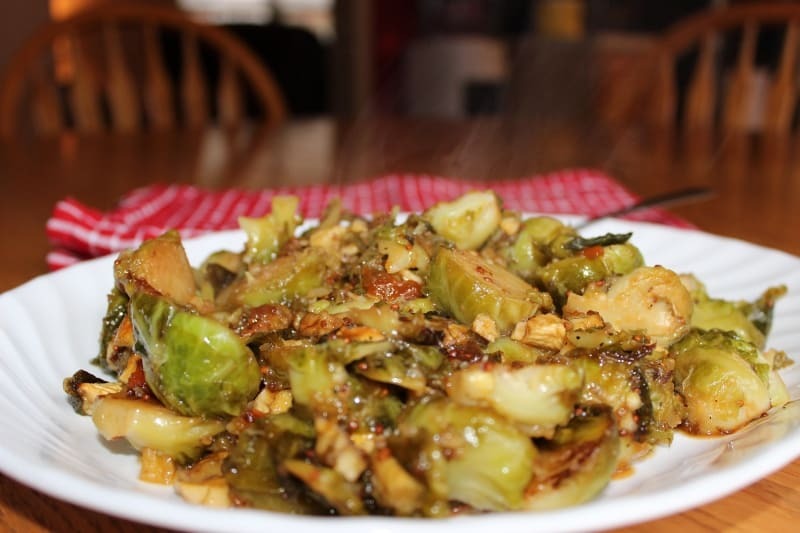 I am a lover of brussels sprouts. Just happens that my husband loves them too. My son used to eat them but has now decided he doesn’t like them. So I’m 2 for 3. Not too bad. 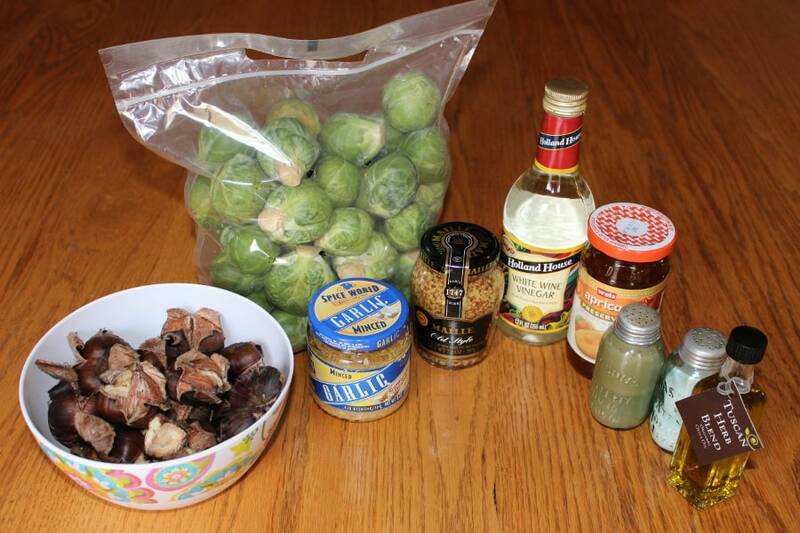 This particular recipe got my attention because it has chestnuts in it. You know how a particular food can bring back fond memories of days gone by? Well, chestnuts are one of those foods for me. I fondly remember my Dad literally roasting chestnuts over an open fire at Christmas time and breaking one open for me to try. I loved the smell of them roasting and the taste was like no other I had tasted before. It was extra special because it was introduced to me by my Dad. So I set off to my local Weis grocery store to get the ingredients. They were all easy to find except for the jarred sliced chestnuts. I asked 3 associates where I can find jarred sliced chestnuts and each one of them looked like a deer in headlights. So I walked back over to the produce section and bought a bag of fresh whole chestnuts and figure I’d just roast and slice them myself. Big mistake. I don’t know how my Dad made it look so easy, but getting that outer shell off and then the skin that covers the nut was next to impossible for about half of the chestnuts that I had roasted. 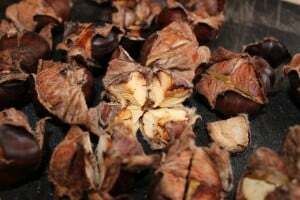 However, I was able to salvage enough chestnuts to slice and include in the this recipe. Bring 1/2 cup water and 2 Tbsp oil to a simmer in a large skillet. Add the brussels sprouts, season with 1/2 tsp salt and cook, covered, stirring occasionally, for 5 minutes. Meanwhile, in a small bowl, whisk together the jam, vinegar, mustard and 1/2 tsp pepper. Uncover, increase the heat to medium-high and cook until the water evaporates, about 2 minutes. 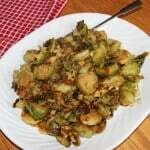 Drizzle the remaining 2 Tbsp oil over the sprouts, add the garlic and cook, tossing occasionally until the brussels sprouts are golden brown and tender, 2 to 3 minutes. The final product wasn’t as ‘pretty’ as I had hoped. 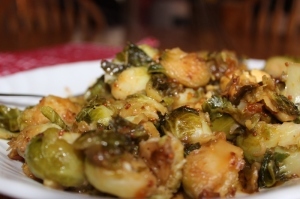 Before adding the apricot jam, the bright green color of the brussels sprouts was so inviting. However, although it didn’t look very pretty, it tasted amazing. The combination of the whole-grain mustard, apricot jam, white wine vinegar, garlic, and chestnuts was delectable. If I make this again, which I will, I will add a little bit less apricot jam, as it was a tad bit too sweet for my taste. I would also HIGHLY recommend finding a grocery store that sells jarred chestnuts. 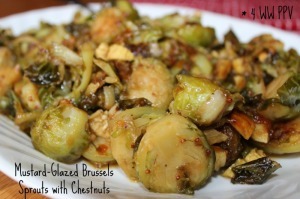 After making this recipe, I was in Wegmans and found jarred chestnuts in their baking aisle. Probably most grocery stores sell this only on a seasonal basis. But Wegmans sells them year-round. 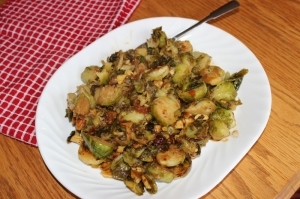 This recipe would be a great accompaniment to your Thanksgiving or Christmas dinner. It’s hearty and stick-to-your-ribs, which is always a plus in my book. And at only 4 Weight Watchers Points Plus Value, you won’t feel guilty after eating them. And if you can find an easier method of roasting those chestnuts so that they’re easy to remove from the shells and outer skin, please let me know. Just smelling the aroma of them roasting in my oven brought back memories for me. Heck, while you’re at it, play ‘The Christmas Song’ to really get into the spirit. THIS SOUNDS AMAZING!!!!! MY WEGMANS OPENED RECENTLY SO NOW I KNOW WHERE TO BUY JARRED CHESTNUTS. THANK YOU!!! I’LL SHOW DAD YOUR COMMENTS!!! Thank you Cherylita! 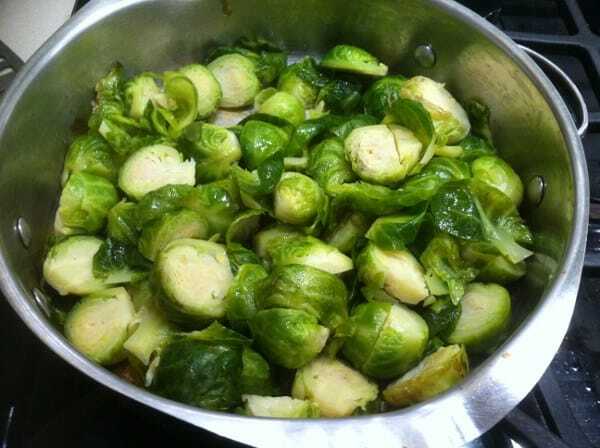 It actually reminds me of the brussels sprouts we got at Ayse. So good!! Did you know that if you select your store, the Wegman’s app will tell you what aisle to find he product in and show you a picture of it! Super cool and saved me hours of ia,less wandering! So good to know Kim! I will definitely use that next time I’m in Wegmans. Did you make the recipe? Just finished making it. Will keep you posted!